You'll be £14.99 closer to your next £10.00 credit when you purchase German Armour Losses on the Western Front from 1944 - 1945. What's this? This is a 144 page compilation of photographs of WW2 German tanks after they were “knocked out of action” on the western front. The photographs are large, one or two per page, black and white, and displaying various states of destruction of the tanks. The surrounding destruction of buildings and dead bodies attests to the recent fighting, and authenticity of the scenes. Each picture is captioned, and there is a brief but informative history introduction. While horrifying, the pictures are riveting. I imagine that they will be of great interest to modelers, war historians and students, and those with a particular passion for tanks. What happened to the crews of the tanks depicted does not bear thinking about. An indispensable source of knowledge for researchers and historians, for the modeller specializing in the construction at scale of combat vehicles, vignettes or dioramas, and for the amateur in general. A marvellous collection of over 200 photographs of German armoured vehicles knocked out from 1944 onwards, from the Normandy beaches and Italy to the borders of the Reich. Almost all of the vehicles featured are those built around the Panzer III to VI chassis, including self-propelled guns and many specific variants of tanks. These are shown in different locations, in shattered streets or muddy and snow covered fields, and in a range of states of disrepair; overturned, tipped on their side to clear the road, with broken tracks, turrets blown off, or simply blown apart. With this broad array of vehicles and situations, this book will certainly be an invaluable guide to the modeller, but it also serves as a reminder of the devastating impact of armour piercing weapons, and the vulnerability of tank crews in their seemingly impervious machines. 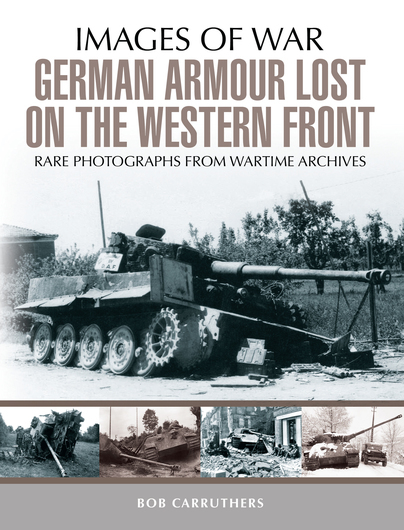 German Armour Lost On The Western Front is an excellent pictograph reference book covering German losses during the Second World War. The pictures are clear and the supporting text provided, factual. I highly recommend this book to any historical buffs or modeling fans who are interested in wrecked and abandoned vehicles. A fine illustration of the vulnerabilities of the tank in the last half of WW2 which holds lots for anyone with an interest in the evolution of the tank in battle. experience and strong editorial control, afford the militaryenthusiast the ability to buy with confidence.